Movie Poster for The Harvey Girls. Image courtesy of Skip Gentry’s Fred Harvey Memorabilia Collection. When Fred Harvey pushed his chain of restaurants farther and farther west along the lengthening tracks of the Santa Fe, he brought with him one of the first civilizing forces this land had known: the Harvey Girls. These winsome waitresses conquered the West as surely as David Crockett and the Kit Carsons—not with powder horn and rifle but with a beefsteak and a cup of coffee. Ahead of its time, the Fred Harvey company was establishing its brand over a century before “branding” became a buzzword. The Fred Harvey logo, composed simply of Mr. Harvey’s signature, was attached to high-quality products such as coffee, whiskey and cigars. Fred Harvey fruit preserves were served at breakfast. For a time, Coca-Cola bottles produced in Newton, Kansas, had the imprint “Fred Harvey Newton” on the bottom. One extremely clever marketing tactic that went far beyond custom labels was an agreement between Fred Harvey and Metro Goldwyn Mayer to make a movie about Harvey Girls. Unfortunately, the Slaton Harvey House closed in 1942, four years before the release of The Harvey Girls featuring celebrities of the time: Judy Garland, Ray Bolger and Angela Lansbury. The familiar song “On the Atchison, Topeka and the Santa Fe,” sung by Garland, won an Academy Award for songwriter Johnnie Mercer. 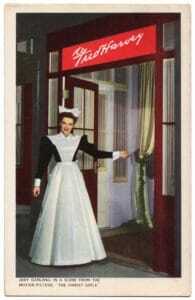 Described by one critic as a glorified commercial for the Fred Harvey restaurants, the 1946 MGM movie may have done the most for perpetuating the story of the Harvey waitresses. Even today, for many this movie is the only version of the Fred Harvey story they know. It can still been seen often on the Turner Classic Movie channel – the next scheduled showing of The Harvey Girls on TCM is April 22, 2016 at 8 p.m.
Judy Garland in The Harvey Girls. Image courtesy of Rosa Walston Latimer. 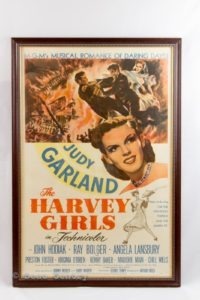 I’ve seen the movie many times and even though real Harvey Girls certainly didn’t dance and sing as Judy Garland and her supporting cast did on the “silver screen,” the story portrayed in the movie was authentic in many ways. One former Harvey Girl told me, “The town girls didn’t like us very well because it was considered quite nice to be able to date a Harvey Girl. I’m sure they didn’t like the competition!” In the movie, the Harvey Girls were not treated well by the local dance hall girls; however, (spoiler alert) they all became friends in the end. An overarching theme in the popular movie true to “Harvey Girl life” was the manner in which the girls treated each other as family. When Harvey Girls and other Harvey employees reminisce about their years with Fred Harvey, invariably, they describe the experience as being part of a large family. The girls helped each other through bouts of being homesick or a romance turned sour as well as with practical matters such as sharing clean uniforms or money. During research at the Cline Library, University of Northern Arizona for Harvey Houses of Texas (The History Press, 2014), I found correspondence between Metro Goldwyn Mayer Pictures and Fred Harvey executives indicating the Fred Harvey company, specifically Fred’s son, Byron, attempted to exert great influence on the advertising of the movie as well as the movie itself. An October 1945 telegram from Byron Harvey Sr. to the MGM publicity department complained that the magazine and billboard advertising gave “the erroneous impression that this picture is largely a burlesque show or that the Harvey Girls were dance hall girls. In my opinion this type of advertising not only misrepresents the general character of the picture but is highly damaging to our company and its employees and is directly contrary to the spirit of our understanding.” Byron also expressed concern that on a movie poster the words “Harvey Girls” appeared next to Angelia Lansbury’s bare legs. Chief publicist and director of advertising for MGM, Howard Dietz, responded from his New York office: “I have gone over the ads and while we do use the dancing girl motif quite frequently it does not seem to be used offensively and is consistent with the idea of a musical picture.” Dietz promised that “wherever possible in material not yet prepared we shall do our best to tone down what you consider objectionable and also attempt to make it clear that the Harvey Girls were not burlesque queens.” In a move to appease the Harvey family, Byron Harvey Jr., grandson of Fred Harvey, was given a cameo as a Santa Fe railroad brakeman. 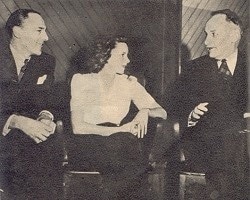 Fred Harvey’s grandson and son, Byron Harvey, Jr. (left) and Byron, Sr. (right) with Judy Garland on the set of The Harvey Girls. Image courtesy of Rosa Walston Latimer. In spite of the internal turmoil during production and promotion of the movie, The Harvey Girls was declared one of the top movies of 1946 based on its gross earnings of $1.2 million. ($12.5 million today) The national attention the movie would bring to Harvey Houses would certainly be a boon for business; however, the upswing in customers was short-lived and Harvey Houses continued to close along the Santa Fe tracks. The popular movie didn’t save the Harvey Houses, but it continues to keep the Harvey Girl story alive. On Friday, April 22 tune in to the Turner Classic Movie channel, grab some popcorn, settle into a comfy chair and let’s enjoy Hollywood’s version of the Harvey Girl experience!